The beauty of the new Underwood Rotogalbe system is that it is designed and manufactured in Switzerland with the same technology and to the same exacting manufacturing standards as our standard Underwood Modular Winding System. Totally innovative in it's use of technology and materials, this unit is available in a leather finish in the traditional colors of black and tan. The system is designed as stand alone winder boxes or can it be extended with special trays. 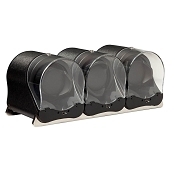 Custom order Rotogalbe watch winders personalized as desired. 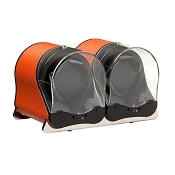 Underwood (London) presents it's new single watch winder for automatic watches: "Rotogalbe". Totally innovative in it's use of technology and materials, this unit is available in a leather finish in the traditional colours of black and tan. 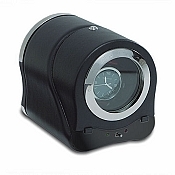 Everyone knows that at the heart of every good watch winder you need a technologically superior motor. Which is why Underwood, for it's collection of watch winders chooses to use motors from the Swiss company maxon motor ag, one of the world's leading providers of the motor technology used in the aeronautics and medical appliances industries. At the heart of every maxon motor is the world-wide patented, ironless rotor "the System maxon®". This motor concept has many specific technical advantages, which for Underwood results in a highly efficient motor with low levels of noise and power consumption. At maxon motor all major components are manufactured in-house using custom-built machinery and key technologies in the areas of winding techniques, gearhead design and injection moulding technology. Having provided the motors for the SOJOURNER rover in 1997, the Swiss company is again involved in NASA's current expedition on Mars. Both of the Mars rovers "SPIRIT" and "OPPORTUNITY" feature 39 maxon motors among their 43 electromotors. Underwood places it's trust in advanced Swiss technology, so you can trust your automatic watches in the care of the "Rotogalbe".